We have been very busy so I haven't had time to post for awhile. 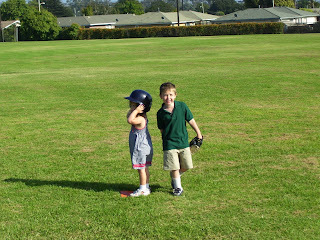 The kids are both taking a t-ball class at the YMCA. 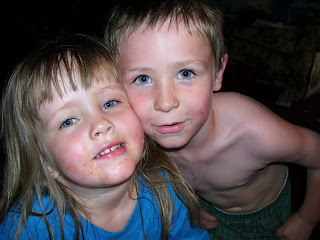 Theresa was eager to play when Travis did over the summer but We felt with her speech issues it wasn't the time. She is talking so much now that it is no longer an issue but we wanted Travis with her still. 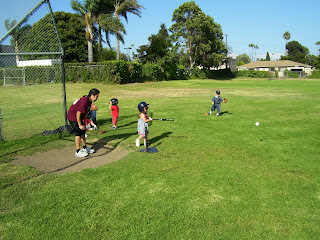 They learn all the fundamentals of t-ball. Theresa is also taking a gym & swim class with Me at the YMCA also. She loves to jump. Travis is loving Kindergarten and is doing well in after school care. They help him do his homework and also give them at least 45 minutes a day of work on school items. Theresa has started back to Assistance League School. She goes Tues, Wed, & Thursday afternoon. She then gets to spend time with Grandma, Grandpa & the doggies until Mom & Dad get off work. Matt & I were able to go to a Dodger game when my Mom was in town. It was so cool. It was Tommy Lasorda's 80th birthday and alot of former Dodgers sent him messages. It was a must go game for true Dodger fans. The kids are very much into sports now. Travis is able to tell you all about Nascar and which driver has which number. Sundays are spent with the kids cheering for Football. Matt is just glad that I love football just as much as him so we will watch the games together. We are in a Yahoo Fantasy league with family and some friends. I am in 1rst place not bad for a girl.